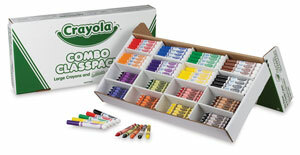 Variety, portability, and dependability come together in these big Combo Classpacks from Crayola. Specially formulated for color intensity and durability, Crayola crayons and markers lay down the bright colors that kids love. Crayola Combo Classpacks come in sturdy cardboard boxes — ideal for storage, organization, and for seeing when it's time to replenish certain colors! 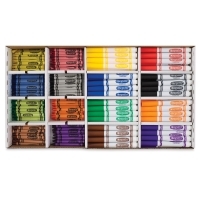 Classpack of 256, Large-Size Crayons and Washable Markers — 128 large-size crayons (4"L × 7/16"Dia) and 128 washable broadline markers, 16 each of Black, Blue, Brown, Green, Orange, Red, Violet, and Yellow. Marker ink washes easily from skin and clothing. Classpack of 256, Regular Size Crayons and Non-Washable Markers — 128 regular-size (3-5/8"L × 5/16"Dia) crayons and 128 non-washable broadline markers, 16 each of Black, Blue, Brown, Green, Orange, Red, Violet, and Yellow.